Nick Dunn and Richard Brook’s interesting book Urban Maps contains a chapter in which they explore the notion of the city as a ‘poly-nucleic model in which the centre and edge of the city are integrated in a variety of urban conditions’. The integrated city considers our sense of place as simultaneously a physiological entity and a knowledge based abstract construct. We inhabit this landscape both as weary walkers and technologically connected thinkers. They argue however that this strict distinction of analysis or ‘bifurcation of the city’ is perhaps problematic due to the rich diversity of cultural interaction between the actual and digitally represented locality. This ‘layered city’ subverts the traditional concept of Ruskin’s picturesque, who posited that buildings should be grounded in blunt materiality and mass, and derive their presence by mirroring nature. He wrote in Stones of Venice ‘when a highland cottage roof is covered with fragments of shale instead of slates, it becomes picturesque, because the irregularity and rude fractures of the rocks, and their grey and gloomy colour, give to it something of the savageness, and much of the general aspect, of the slope of a mountain side. But as a mere cottage roof, it cannot be sublime, and whatever sublimity it derives from the wildness or sternness which the mountains have given it in its covering, is, so far forth, parasitical.’ In Ruskin’s eyes the architecture is a pure manifestation of God given natural order, structures do not exist in any other consideration except material form. The connected city encourages us to also look with digitally enhanced eyes. Smart-phone applications such as Instagram capture a fake vintage aesthetic and instantly transpose this to a shared digital map. The representation of the urban grid becomes intimately linked to our appreciation of this realm by the use of geosynchronous satellite mapping and web enabled software. Instagram plays upon nostalgic analogue Polaroid camera techniques in order to simulate digital memories of place. Dunn and Brook note that this linked ability has given rise to ‘a schism between the high degree of connectivity that permeates digital networks versus the increasingly fragmentary nature of the physical urban condition’. A hybrid aesthetic is formulated in order to facilitate a dialogue between Ruskin’s raw fabrications and the contemporary position of artifice. However this computational derived branding is often simply utilised to justify cartoon-like fabrications that fetishise software culture, cities occasionally become victims of erstwhile neon fashions, such as the crystalline Tokyo structure shown below. 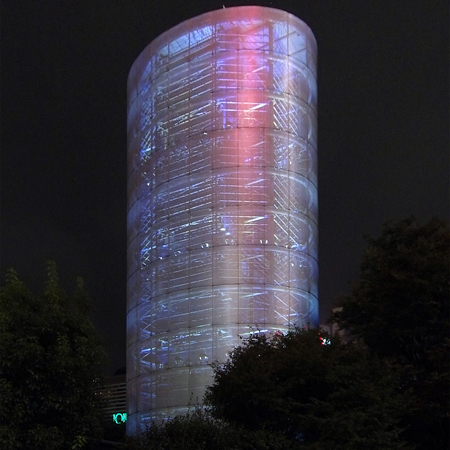 Tower of Winds by Toyo Ito 1986 (Wikimedia Commons). In Rachel Hewit’s excellent book Map of a Nation on the history of the Ordnance Survey she quotes Fra Mauro (a pioneering cartographer), who wrote ‘my map was only one version of reality, it would only be of any use if it were employed as an instrument of the imagination. It occurred to me that the world itself should be seen as an elaborate artifice and the expression of a will without end’. Mauro back in the 15th century realised that a conceptual notion of place and its existence as a distinct object could not be conceived of separately. The map is more than simple image and could be regarded as a parallel form of language echoing Walter Benjamin who wrote ‘the word must communicate something (other than itself). Mauro’s map links the picturesque landscape with human analysis in this instance in an attempt to document the extent of the known medieval world and become more than a mere drawing or symbol. Can architecture conceive of a fabrication that follows a third way, neither the naive simplicity of Ruskin nor the cyberpunk fantasies of data embedded glowing towers, one that links the mind and the body in a more intimate manner? One thinker Christian Norberg-Schulz has attempted to reconcile this sense of meaning of place, addressing phenomenological concerns within the parameters of architecture. He writes ‘architecture is a concrete phenomenon. It comprises landscapes and settlements, buildings and characterizing articulation. Therefore it is a living reality. Since remote times architecture has helped man in making his existence meaningful. With the aid of architecture he has gained a foothold in space and time. Architecture is therefore concerned with something more than practical needs and economy. It is concerned with existential meanings. Existential meanings are derived from natural, human and spiritual phenomena, and are experienced as order and character. Architecture translates these meanings into spatial forms… Architecture ought to be understood in terms of meaningful (symbolic) forms. As such it is part of the history of existential meanings. Today man feels an urgent need for a reconquest of architecture as a concrete phenomenon’. Bruder Klaus Chapel by Peter Zumthor 2007 (Wikimedia Commons). 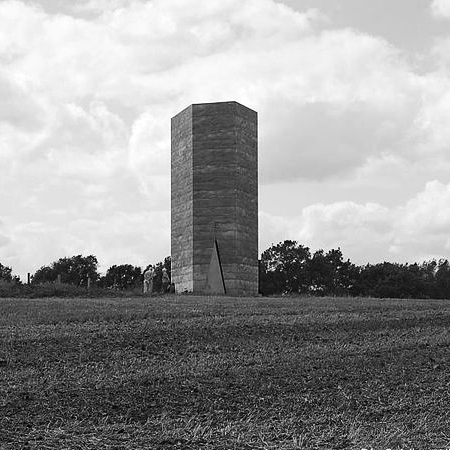 Zumthor’s Bruder Klaus Field Chapel (2007) is a wonderful example of a delicate process of consideration, ‘every touch, every join, every joint is there in order to reinforce the idea of the quiet presence of the work.’ The chapel was built by farmers wanting to honour their local saint. It was constructed by forming a conical shape of trees, wrapping the geometry in oblong form-work and then pouring concrete over them. Once the concrete had set the timber was burnt out in order to leave an enigmatic charred grey wedge open to the skies. The mysterious mass externally has a solitary funereal quality and internally a womb-like cave. 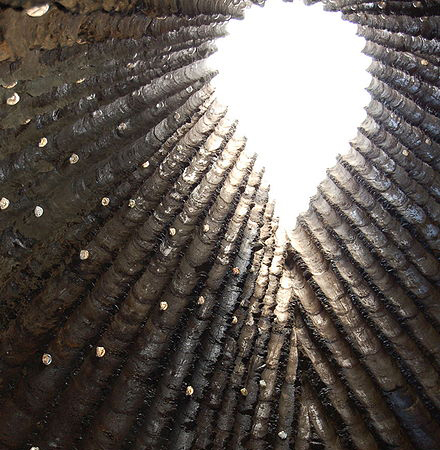 Gazing upwards from the quiet interior the open iris at the crest glows like the sun, fingers of gold trace downwards and pick out the cast lead floor, whilst the undulating charcoal walls shimmer, pierced by the glazed apertures left by removed ties. Zumthor notes ‘if a work of architecture consists of forms and contents which combine to create a strong fundamental mood that is powerful enough to affect us, it may possess the qualities of a work of art. This art has, however, nothing to do with interesting configurations or originality. It is concerned with insights and understanding, and above all with truth’. This is an explicit space for silent contemplation through the use of an evocative palette directly connecting the solid with the ephemeral order of things. It is a meditative device or memory machine, one which endeavours to facilitate a ponderous internal dialogue. Bruder Klaus Chapel by Peter Zumthor 2007 (Location) (Wikimedia Commons). Writer Rebecca Solnit considering the question of inhabitation and motion, observes ‘in great cities, spaces as well as places are designed and built: walking, witnessing, being in public, are as much part of the design and purpose as is being inside to eat, sleep, make shoes or love or music. The word citizen has to do with cities, and the ideal city is organized around citizenship — around participation in public life.’ For Solnit the city only comes alive through this participatory dialogue of information and interaction. Bruder Klaus Field Chapel attempts to reconcile the stark schism between both memory and surface and link these divergent municipal threads. In doing so it creates a sublime narrative between the disjointed nodes of the poly-nucleic infrastructure and welcomes us all into its patient ‘reservoirs of architectural atmospheres’. Excellent blog – stimulating, wide-ranging, and deeply considered. Good stuff! I enjoyed this post very much. Very useful in fact as I’m currently writing about the relationship between film, urban space and maps. Architectural atmosphere can also be read as ‘ornament’, if one defines ornament as the interaction of the subjective and the objective, or feelings and materials. Oh that’s sounds intriguing, I look forward to reading it. Certain films portray a kind of living city which can be enthralling, whether that is Naked or Blade Runner. There was a period of architectural design which embraced the notion of the cinematic city and Derrida’s event space, in an age of self promotion on the internet this has almost come to pass. Heh, I saw that, does little to disprove the theory of the architectural phallus! Great post Matt. Lots to ponder on and think about. Very taken with the Zumthor chapel. Thanks, the work of Zumthor is definitely worth investigating, I’ve visited a number of his buildings and also met him too, the work has an amazingly rich quality that’s hard to place or sometimes even describe! You write so well about architecture Matt! I am a great admirer of Norberg-Schulz, and have many of his books. He does have a following among certain contemporary architects even if unacknowledged. The only work by Zumthor I have seen was the Serpentine Pavilion of a few years ago which I loved, although I must admit as much for the planting as the architecture! (http://dianajhale.wordpress.com/2011/10/12/serpentine-pavilion-2011/) I would love to see more. Some very interesting links of ideas here, thanks. I confess I’d only come across material of NS in other collections of architectural writing. Zumthor is definitely worth investigating, if you ever get a chance to see his early projects in Switzerland you must, so understated and yet deeply moving and beautifully conceived. I shall click now on your link! Plenty to chew on here Matt, a great post.